FRC | News » Archive » Come see the new inView 360 at FDIC! Come see the new inView 360 at FDIC! 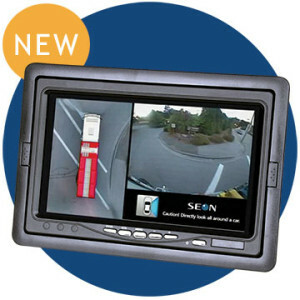 Visit us at FDIC booth 3357 to see the new inView360 which is a cab mounted display with a split screen view. The bird’s-eye view provides an always visible 360 degree view around the vehicle. This unique view allows the operator to see pedestrians and obstacles in close proximity to the apparatus or vehicle. The second view automatically switches to display the view to the front, rear, left or right side of the vehicle depending on the operational conditions. This second view can be manually overridden to show a specific view as desired. Read a brief inView system overview. Read more about the inView 360 described here. Read about the inView Guardian another component of the complete system. Download the full catalog from either of the product pages above or from our Catalogs page. If you have a specific question, give us a call or send us a note from the Contacts page.